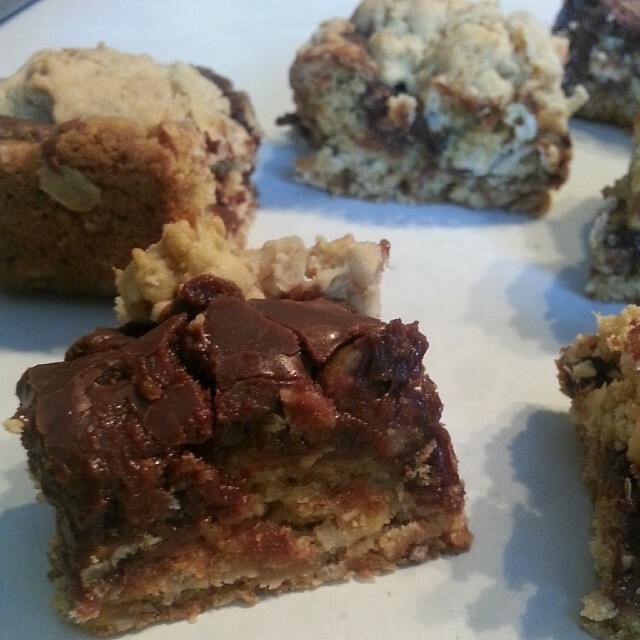 These two-layer bar cookies are easy to make and even easy to cut. Although chocolate is the star, it’s the combination of chocolate, oatmeal and nuts that make this cookie so delicious. This recipe makes between 60 and 75 bars, so it’s perfect for gifting. Set aside 2 tablespoons of the butter or margarine. In a large mixing bowl, beat the remaining butter or margarine with an electric mixer on medium speed for 30 seconds. Add brown sugar; beat until well mixed. Beat in eggs and 2 teaspoons vanilla. In another large bowl stir together flour and baking soda; stir in oats. Gradually stir dry mixture into beaten mixture. Set aside. Press two-thirds of the oat mixture into the bottom of an ungreased 15x10x1-inch baking pan. Spread chocolate mixture over the oat mixture. Using your fingers, dot remaining oat mixture over the chocolate. Bake in a 350 degree F oven about 25 minutes or until top is lightly browned (chocolate mixture will still look moist). Cool on a wire rack. Cut into 2×1-inch bars. Makes about 75 bars.